In recent years there has been a resurgence of interest in the work of Emmanuel Levinas, widely recognized as one of the most important yet difficult philosophers of the 20th century. In this much-needed introduction, Davis unpacks the concepts at the centre of Levinas's thought - alterity, the Other, the Face, infinity - concepts which have previously presented readers with major problems of interpretation. 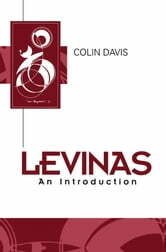 Davis traces the development of Levinas's thought over six decades, describing the context in which he worked, and the impact of his writings. He argues that Levinas's work remains tied to the ontological tradition with which he wants to break, and demonstrates how his later writing tries to overcome this dependency by its increasingly disruptive, sometimes opaque, textual practice. He discusses Levinas's theological writings and his relationship to Judaism, as well as the reception of his work by contemporary thinkers, arguing that the influence of his work has led to a growing interest in ethical issues among poststructuralist and postmodernist thinkers in recent years. Comprehensive and clearly written, this book will be essential reading for students and researchers in continental philosophy, French studies, literary theory and theology.